The Endicott Estate was purchased during the War of 1812 by Joseph Peabody, the wealthiest Salem shipping merchant of his day, as the summer retreat for the family for more than 140 years. By 1892, the property belonged to Ellen Peabody Endicott, Joseph Peabody’s granddaughter, who further enlarged and embellished the central house known as Glen Magna and surrounding grounds. Following her death in 1926 her son, William Crowninshield Endicott, Jr., continued to lavish attention on the Farms, upgrading and enhancing the estate until his death in 1936. He was instrumental in bringing the Derby Summer House (built in 1794) to the property in 1901. The two story Adamesque building has been listed as a National Historic Landmark since 1968. The property has entertained two American Presidents, Taft and Cleveland. 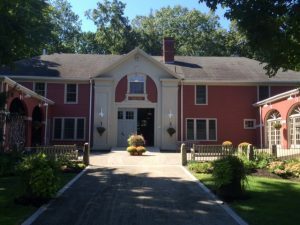 In 1961, under former Town Manager Robert Curtis the Town purchased 165 acres of the property for $330,000, including all the outlying farm buildings, saving it from a 250 home residential development. The remaining central eleven acres and central house was purchased by the Danvers Historical Society. Dave and Joan Townley were hired by the Town of Danvers in 1972 to come up with a master plan for what would later be known as Endicott Park. They devoted the next 41 years of their lives to implementing that plan and serving as stewards of this beautiful park. Today, Endicott Park attracts nearly 160,000 visitors a year. It is home to some of the most unique and varied recreational land on the North Shore. 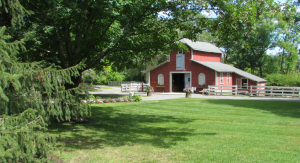 The park’s varied landscape includes pastoral views, historic farm buildings, orchards, woodlands, and marshes, with a network of trails and gravel roads for stress free exploration of the park. Passive recreation activities for all ages abound, ranging from hiking, fishing, picnicking and enjoying the playground in the warmer months, to sledding, cross country skiing, and snowshoeing in the winter. Spotting wildlife throughout the year is not uncommon and can include species such as cottontail rabbits, beaver, coyote, whitetail deer, and a plethora of grey squirrels! In addition, the bird watching can be very productive, with ample food sources and resting areas for resident and migrating species. Endicott Park is open 365 days a year from 9am – sunset. A staff of three (3) full-time and three (3) part-time/seasonal Park Rangers are responsible for the stewardship and maintenance of the grounds, facilities and care of our farm animals. In addition to their stewardship, public safety and maintenance responsibilities, staff also offer year-round environmentally orientated recreation programs. 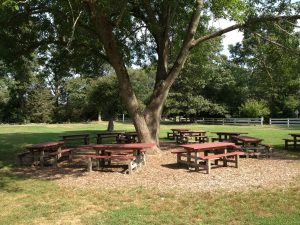 Due to the overwhelming interest in our park for those who are looking to host family gatherings, BBQs, birthday parties, company and church outings, the Town requires all organized groups, for-hire photographers and commercial vendors to obtain a permit reservation. You can find more information on reservations and permits under our Permits & Fees tab. A daily use parking fee is required on weekends and holidays at the rate of $3/per non-resident vehicle and $1 per Danvers resident vehicle.